Sometimes it's easy to get overwhelmed with the sheer scale or complexity of a build or group project on your favorite server. Too much stress from any creative endeavour can lead to mistakes, discouragement, or fighting among a community. What better way to relieve stress and entertain the troops than some old fashioned competition? Spleef is by far one of the most popular home brewed games in Minecraft and definitely one of the most fun. I've spent a lot of time working on Minecraft servers, and I can tell you that I've never laughed harder at a community game of Spleef. 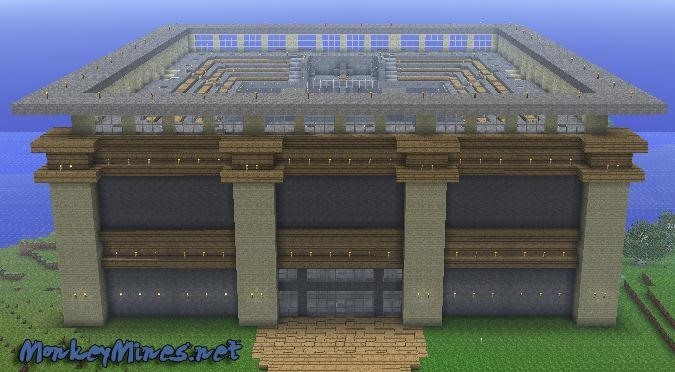 An example of an epic Spleef Arena. Courtesy of Monkey Mines. The great thing about Spleef is how simple it is. Spleef can be played with any number of players (two or more), on any map, in any Minecraft version, and for any length of time! Let's take a look at the rules of classic Spleef. The objective of Spleef is to break the blocks underneath your opponent before he breaks the blocks underneath you. This is the most fundamental element of Spleef. In a game of classic Spleef, the player wins a game when he is the last person standing on or in the Spleef Arena. The Spleef Arena is as simple as it gets. It's a room with a big floor. Typically, it is 40 x 40 blocks large or larger. Now, a Spleef floor can be many things, but during a game of classic Spleef, it is usually an easily breakable material like glass or snow. Sometimes the players are given a tool like a pick axe to make the breaking of blocks even easier. Underneath the floor may be any number of materials from water to lava. A typical game of Spleef can run anywhere from a few seconds to several minutes or even longer depending on rule variation and arena size. If you've never played Spleef and are skeptical of just how fun it can be, take a few minutes and watch an epic game of Spleef unfold between YouTube celebrity SeaNanners and world-famous electronic music artist Deadmau5. Just look at the childlike glee on their faces. Now, if classic Spleef sounds a bit boring to you or isn't quite your speed, there are endless variations of the game that can provide hours of added fun. Let's take a look at some common variations used to change the game. No Jumping Spleef—No jumping Spleef is pretty straightforward. A roof is erected above the players heads' not allowing them to jump at all during the game. This creates a huge tactical swing in game mechanics, as players now can only run from opposing players. Team Spleef—Team Spleef can be a lot of fun and usually results in a more tactical style game. Multi-leveled Spleef—Multi-leveled Spleef is a game of Spleef wherein the Arena has many levels to it, so that when a player falls he is not out of the game, but in another level. The great fun involved in this variation is in removing the blocks above you once you've fallen one level. Even more variation can be added to this style Spleef by varying the block types used in each level or eliminating the first player to fall from each. Dark Spleef—This is simply Spleef played in pitch darkness making for an even more challenging game. Hard Block Spleef—Hard block Spleef is played using blocks that take much longer than a second to destroy. This requires players to be tactical and to plan out their every move. Hard block Spleef can be especially effective in team Spleef. Reverse Spleef—During a game of reverse Spleef, players are actively attempting to mine themselves to the bottom of the arena, while trying to stop each other from doing so. Variations of block type may be used. These are just a few of the most commonly thought-up variations of the game. If these do not satisfy your competitive cravings, just think of some of your own variations to arena style, block type use, or player rules. Feel free to add a wild card element in there like mobs that attack players while they play or the use of water buckets. Spleef is only limited to your imagination. If you like playing Spleef or have never tried it, why not join our server and play in our very own state of the art Spleef Arena?